A book giveaway, a copy of my book GROW FRUIT NATURALLY. Check out my new video Life on the Farmden and reply to this post with what other plants, aside from those mentioned or shown, you think I should be growing here on the farmden. I’ll choose a winner randomly from all the replies. Two plants have been disappointments this year. 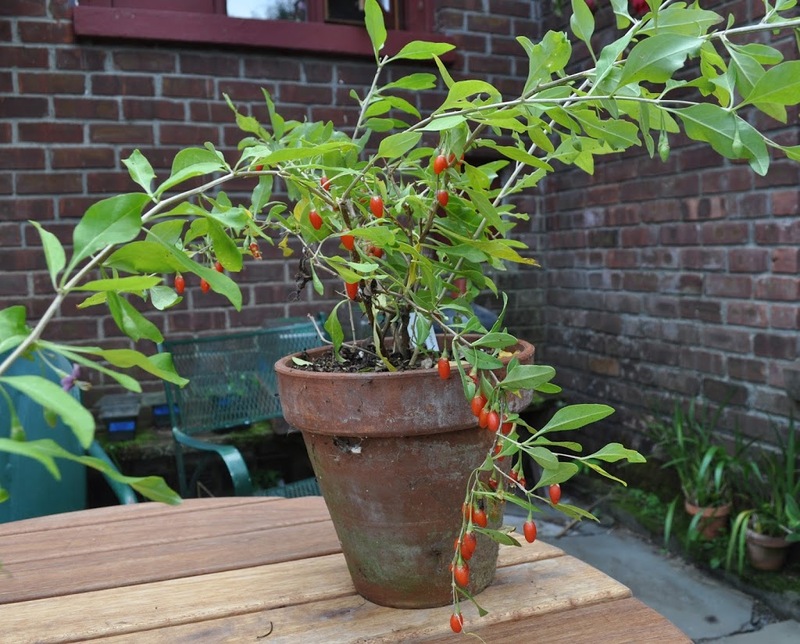 Goji berry (Lycium barbarum), the first, has been touted as a wonder food, effective for diabetes, high blood pressure, poor circulation, fever, malaria, cancer, erectile dysfunction, dizziness, and ringing in the ears, and for reducing fever, sweating, irritability, thirst, nosebleeds, cough, and wheezing. It’s also used — this Chinese plant has a long history of use in Chinese medicine — to strengthen muscles and bone, and as a blood, liver, and kidney tonic. Wow! As amazing as this plant is purported to be, it’s easy to grow. Too easy, in fact, which is one of the problems growing it. Lanky, arching, thorny canes grow from the base of the plant, taking root wherever they touch ground. Turn your back on a planting it soon becomes a tangled mass of thorny canes. But that must be worth it, considering the miraculous benefits of the berries, right? Like so many miracles, this miracle is pretty much unsubstantiated. The flavor, then, must make the plant worth growing, right? Wrong. The berries taste awful. Worse, they taste poisonous. And, in fact, like other members of the deadly nightshade family, which does admittedly, include tomato, pepper, potato, and eggplant, goji does contain some toxins that cause adverse reactions in some people. Still, if you believe in miracles and happen to like the flavor, goji is easy enough to grow and bears the first season, so may be worth growing. Not for me, though. Now, here in the 21st century, we have better tomatoes than were available back in 1975, mostly in the form of a lot of excellent heirloom varieties. And because of one relatively new, hybrid cherry tomato, Sungold, that tops all other cherry tomatoes as far as I’m concerned. This year, after many decades without it, I decided to grow Gardener’s Delight again to see how it compared. The plants grew well and bore quickly. The fruits, however were awful, with mushy texture and bland, mushy flavor. “Blame it on the weather” would be a convenient explanation. In my experience, weather’s effect is not that significant on tomato flavor. My more discriminating taste buds? I don’t think so; the difference between what I remember (and wrote) and what I now taste is too great. I feel bad, like an old friend has gone to pot. One more explanation might bring hope. Gardener’s Delight is an open-pollinated variety. Whoever supplied the seed could have accidentally allowed some cross-pollination with another tomato variety. 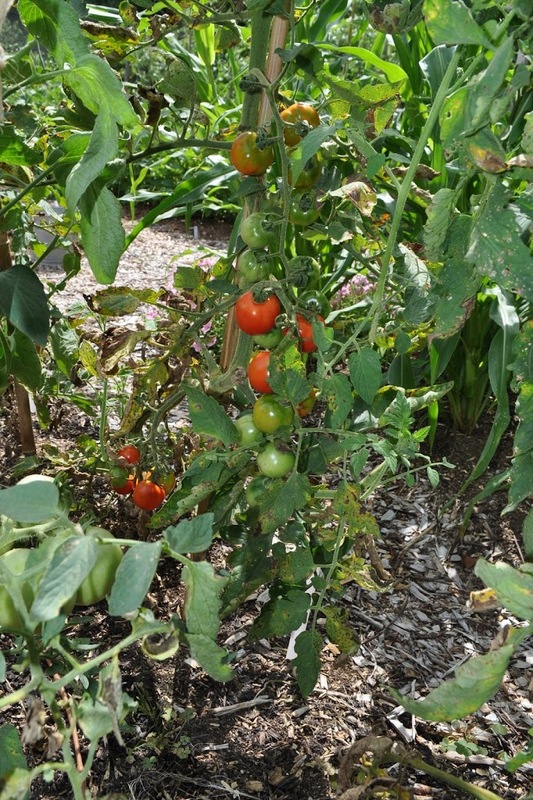 The tomato gets rave reviews from some web reports; other reports concur with me. I’ll try again, with a different seed source. Every gardening season has it’s quirks, but this year has been the quirkiest yet, a perspective reflecting decades of gardening in four different states. Oddly enough, the season started off being quirky by being so conventional, or, at least, by being what was supposed to be so conventional. That is, temperatures gradually and steadily warmed in spring, without intervening freezing or torrid spells. Okay, cicadas were predicted. Still, they were strange and right here, at least, much more abundant than they were last time around, 17 years ago. They’ve left a legacy of browned ends of stems dangling from trees along roadsides. I look forward to not seeing that again for 17 years. Japanese beetles are surely no strangers around here, making there entrance, as I mentioned a few weeks ago, just as the cicadas were making their exit. But the strange — and very welcome — quirkiness of this year’s beetle invasion is that it pretty much ended soon after it began. Stink bugs, likewise expected by now, have yet to make their entrance. Perhaps this summer’s Japanese beetle quirk is related to the weather quirk. No, not the nice (for humans) spring temperatures which, being below ground, the beetles hardly would have noticed. Weather quirks included June’s incessant rainfall, more than twice the average, followed by July’s throbbing heat, more than 5°F above the average (which would have been higher had not the last week in July been so comfortable). Another pest that hardly reared its head here was Mexican bean beetle, which I’ve battled for the past 20 or more years. The reason might be the biological sprays I tried, a mix of Entrust (derived from a bacterium collected from the soil of an abandoned sugar mill in the Virgin isles), Azamax (an extract from the tropical neem tree), along with commercial extracts of hot pepper and garlic. Dense bean foliage and my attempts to limit the sprays only to the bean plants made for less than thorough coverage, leading me to guess that something else might also be a factor. The weather again? Another quirk: dragonflies. I’ve never seen so many of them as this year. The final quirk concerns breadseed poppy, a self-seeding annual flower that has showed up reliably every year at various locations of its own choosing around my gardens and beyond. This year: almost none. My guess is that the reason has something to do with something I did. But what? Who knows? The above observations are very casual and very local, mostly right here on my farmden along the Wallkill River in the Hudson Valley. I wonder: Cicadas notwithstanding, has anyone else experienced garden strangeness this year? This entry was posted in Uncategorized and tagged book giveaway, cicada, dragonflies, Gardener's Delight, goji, Japanese beetle, Lycium, Mexican bean beetle. Bookmark the permalink. Trackbacks are closed, but you can post a comment. I have seen much fewer butterflies this year than in past years. It been so unseasonably cold in NE Ohio this year, and after all the rains we had, that I keep blaming the weather on my poor tomato production, and seemingly late tomato ripening this year. With some nights dipping down to 48, I worry the tomato plants are going to think it’s fall already! Oddly, I have seen more butterflies this year, and about the same number of dragonflies. You and I are in the same area, so it’s interesting how different that is. As for garden weirdness? I had to “top” my tomatoes to stress them to get them to ripen, and the eggplant has been in a tunnel to try to get some fruits from them. I’ve never had to do that before, but with the 50 degree nights, it seemed prudent. I would like to see you find a way to grow Jujubes on your Farmden. I enjoyed the video of your farmden and I’m looking forward to seeing more. I own all your books except “A Northeast Gardener’s Year” which I will eventually buy so don’t pick me! I do have a 2 jujubes. I planted one of them out many years ago and it died back but still resprouts every year from a foot or two above ground level. It died below the graft so it’s the seedling rootstock that’s sprouting. Sometimes it blooms and sets a few small fruits that aren’t particularly good but probably aren’t ripe anyway. My other jujube, Li, is in a pot, just so I can watch it grow. No fruit yet. Have you tried Fuzzy Kiwis? Fuzzy kiwis are not cold-hardy here. Also, I don’t think they taste as good as the hardy kiwis (Actinidia arguta and A. kolomikta) that I do grow. One other kiwi that I would like to grow is the golden kiwi (A. chinensis), which I describe in my book GROW FRUIT NATURALLY. Unfortunately for me, it’s tropical, hardy in zones 8-10. What to grow? Jim Crawford, local organic grower, recommends Delicata squash, and my city dwelling daughter insisted I plant Kabocha squash. Both were spot on. I’m growing the new Blush tomato this year, and it’s now one of my top picks. Very sweet, but complex flavors that make me feel like Precious with a dog biscuit. Good as it is raw, roasted is even better. Mostly I want you to try Eddy’s Winter Wonder olive. It’s a zone 6, but surely you can find some space on a south facing wall? A zone 6 olive tree, for heaven’s sake. It seems they are only being sold in the Pacific Northwest. Ann olive outdoors? I suspect my zone 5 growing season is not sufficiently long. I do have an olive in a pot; it flowers and fruits regularly, but the fruit has never yet ripened. 2. Exotic Fruits (Not just growing tips, which are extremely helpful, but also some idea of what the fruit tastes like. For example, consider a Shipova: very interesting, cross-genera and all, but I have no idea what the fruit tastes like, or whether it will grow in Zone 8A or not. Grow doesn’t just mean leaf out, but also fruit at a meaningful level). 3. How to deal with/understand climate change. In addition to getting hotter, rainfall in Atlanta is also getting weirder. Can I grow oranges here now? 4. Finally, must have collards. Agreed that all years are quirky, and this one certainly qualifies. We have ~8 years experience in central Missouri, and this has been one of the least problematic pest years with respect to plants… relatively low populations of squash bugs, cuke beetles, blister beetles, etc. Japanese beetles have been worse than usual for us, but relatively mild compared to what they could be based on what I’ve heard/read. Ticks, on the other hand, were outrageously prolific through late spring/early summer months. The dreaded Spotted Wing Drosophila has just arrived, so we’ll see how that plays out. Dragonflies have certainly been prolific here. Would love to know more specifics about what they’re eating, but I love watching them dart after insects, especially when the sun provides back lighting for their prey. allowing other insects to reproduce out of control; by the time the cicadas were done, the predators just couldn’t catch up. But your observations of a relatively problem-free year in a cicada zone don’t seem to support that hypothesis…. Nice video. I am looking forward to more installments, which I assume will be linked to your blog. Other than being there in person, nothing compares to video teaching/sharing. Re: the book give away: I didn’t see any mention of nuts, but I have to assume you grow filberts – good nuts, attractive trees/bushes – what’s not to like? If you do grow them, do you do so as bushes or trees, and do you have a favorite variety? It’s interesting your goji has such unpalatable berries. My one trial bush has berries that are moderately sweet and mild flavored. It’s a named variety – Crimson Star, I think. The fruit is pleasant enough, even if it doesn’t cure anything. Love your books and blog. How about growing hops and cider apples? This way you have something to drink when relaxing on your farmden. No tomato hornworms in my garden in NW Illinois this year, not a one! What about maypops (Passiflora incarnata)? With a little protection, they would probably survive in your zone. I love having them in my yard and they are a magnet for bees! I just learned about your books and your teachings from a friend who attended your conference at the NOFA conference. She admired your enthusiasm and advice and you certainly stood out for her among the many speakers. We just spent a good hour discussing what she learned at your talk and how to extend those elucidations to our future farmden adventures. As for a plant you should be growing on your farmden: I was born in Hungary and have a deeply-rooted affinity for sour cherries like many eastern Europeans. How about the variety highlighted recently on NPR (http://www.npr.org/blogs/thesalt/2013/05/27/186270141/a-hungarian-cherry-trees-long-trek-to-michigan) that I consider the tastiest of cherries. Called the Balaton variety, the breed was introduced to the states in the 90s and it grows relatively well in the colder climate zones of Michigan. I planted Balaton a couple of years ago and tasted it for the first time this summer. I thought it tasted okay. Perhaps the taste was overshadowed by the Nanking cherries I have growing right next to it. For me, Balaton had it over Nanking for size and texture, but Nanking won out for taste. Different strokes for different folks. Can you give us a little more info on the video? It appears to be a series of edits from some forthcoming series? I would love to see a series of videos highlighting your farmden, gardening advice, etc. Keep them coming. The first video was like a movie preview. I promise that the ones that follow will be more instructional. The next one should be up by the end of next week (August 30th). Nice overview. You did a very nice job. Easy to listen to and watch and you just don’t get too many like that these days. Future, in-depth videos should be easy to follow and learn from. Beautiful dog! Thanks for sharing. Is there such a thing as a Mulberry bush (such as mentioned in the nursery rhyme of our childhood, Pop! Goes the Weasel or more commonly known as, All Around the Mulberry Bush)? If there is, what are the berries like? Are they prolific in producing berries? Are they quick growing? If they are not available, how could one go about creating them from mulberry trees? Maybe a future video??? ?